Melt butter in a saucepan over medium-low heat; cook and stir onion until softened, 5 to 10 minutes. Add mustard, poppy seeds, and Worcestershire sauce; cook and stir for 5 minutes. Arrange the bottoms from each roll in the prepared baking dish. Spoon 2/3 the onion mixture over the roll bottoms. Add ham and Swiss cheese to each roll. 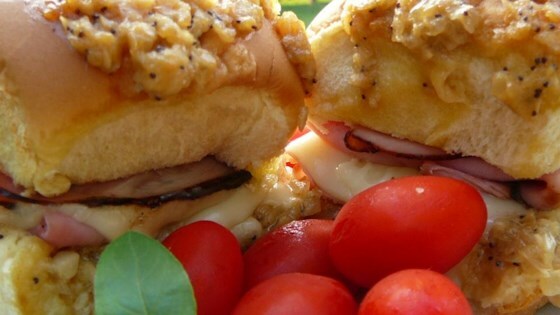 Put tops of rolls over the Swiss cheese layer. Brush the remaining 1/3 onion mixture over tops of rolls. Cover dish with aluminum foil. Bake in the preheated oven for 15 minutes. Remove aluminum foil and bake until tops of rolls are lightly browned, 5 to 10 minutes. Been making these for a long time...copycat recipe!!! 2/5/17: 48 mini Hawaiian rolls. 1 c. Butter, 1 finely chopped onion, 4 T Dijon mustard, 2 T poppyseed, 4 t worstershire sauce, 2 lb deli ham, 16 slices Swiss cheese.